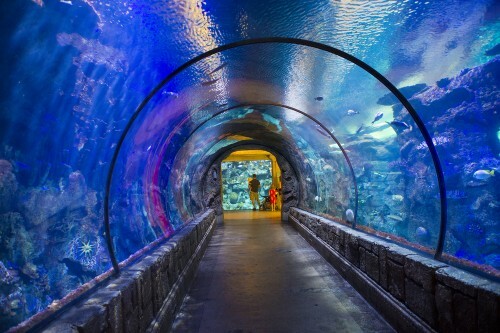 When my son was a small boy, perhaps five or six years old, a new aquarium opened in San Francisco. It was billed as a wild and dangerous adventure. The commercials showed daring explorers moving through a tunnel where sharks, rays, and other exotic creatures swam around them. There are many exhibits like this now, but at the time it was unique … and my son had to go — so we did. After standing in the kind of really long line that is the trademark of these kinds of attractions — you know the line I’m talking about, right? The line so long that after an hour you can’t remember why you’re there? Meanwhile your child has to pee, eat, and sleep but refuses to leave. Anyway, after enduring the adventure of the line we arrived at the beginning of our underwater exploration. Except it wasn’t really all we had made it out to be in our wild imaginations. In fact, it was simply a moving track, like the ones in the airport that move you from gate to gate, that moved you through a Plexiglas tube while sea life swam harmlessly on the other side. For my son, however, it was everything he had hoped for. He ooooooohhhed and aaaahhhhhed. He ducked when a shark passed menacingly by. He jumped as a ray swam right up to the glass “trying to eat him.” And through all the drama occurring in the vivid imagination of my five-year-old son, the track kept moving along. Regardless of the fear and excitement we moved through the tube at a steady, predictable pace just like everyone else on the people-mover. I remembered this event because the other day I saw a tweet about a study that one of the major investment banks had done. They had commissioned a report to determine which kind of investment account was the most profitable over the long term. What do you think the answer was? Mutual funds? Hedge funds? Munis? High risk? Low risk? The answer (and I’m sure the bankers blushed when the results were presented to them) was the best type of account over the long term is one that the investor has completely forgotten about! Think about that for a minute. The most profitable account is one in which no one does anything special; they just make a decision and then forget all about it. Doesn’t that make you feel like throwing your shoe at the pundits on CNBC?! After reading the article I looked up the stock of a company where a dear friend of mine works. I toggled through the various graphs of the stock’s performance — 1 day, 1 week, 3 months, 6 months, 1 year, and finally 2 years. The 2-year graph, the one that most closely resembled the “forgotten account” scenario, showed a steady upward climb; in fact, the line almost looked smooth, as if each day the stock went up just a little bit like the steady grade of the hill I like to walk for exercise. But the others, the ones with shorter time windows, had very dramatic peaks and valleys. It was almost like looking at two different realities — one steady and smooth and one dramatic and severe. As I looked at the charts I fixated on those dramatic down points and the equally dramatic ups that followed. I wondered what those were? After all, I knew from the 2-year chart that the reality was a methodic upward climb. And then it hit me, those valleys, the moments of drama, were exactly what my son had experienced watching the “dangerous” sharks while standing on the methodical people-mover — a really exciting story that made him feel alive. I’m not saying that ups and downs in finances and, from an even wider angle, in life aren’t real. Because they are relatively real. What I am saying, though, is that when we widen out the timeframe, when we increase the amount of data we allow in, life is that people-mover and we are all moving slowly, and often quite boringly, along. And boy those ups and downs sure make life fun, right? Just like my son ducking and covering his face and yelling at the sharks, which swam safely on the other side of the glass. How many of the problems we face in life could pass by safely if only we’d allow them to happen without engaging in our daily drama? Why do we focus on the dangers when a wider view so often shows a much calmer, less dramatic view? I think the answer is the same reason my son didn’t just close his eyes and safely ride the people-mover through the aquarium — because it’s not fun. And maybe that’s why we focus our attention so intently on life’s ups and downs while overlooking the slow and steady growth and learning we experience. – After a lifetime of your kid being a great child, the principal of his school calls to tell you that your child has broken one of the plethora of rules the school has to keep kids from being kids … how do we react? – After a life of health the doctor gets the results back from one blood test and tells you that your body is experiencing dis-ease. He gives that dis-ease a scary name and advises immediate and dramatic action. What do we do? – Your spouse has a tough day at work and comes home, forgets to say “I love you,” and goes straight to bed. What’s the first thought that comes to mind? Let’s pause here and take a few really deep breaths. This isn’t about blaming ourselves. It’s just an exercise in awareness, an opportunity to see how we manage our lives. Beyond these obvious examples is the opportunity to focus on all the goodness in our lives, to look beyond the momentary dramas and find the longstanding beauty that prevails. Let’s take another breath around that thought, “My life is filled with longstanding goodness and prevailing beauty.” How different, right? No more sharks and cliffs — instead we start to feel peace and calm. This brings up the final point in the aquarium analogy. Why was my son emotionally able to make it through the frightening experience of moving through the shark tunnel? What did he feel that day standing with me? Well lemme tell you what I felt … I felt that my son was going to break my hand with the pressure of his tiny little fingers squeezing mine as he held on for dear life! My son “survived” because he felt supported and cared for by his dad … he was safe because he trusted me. Whose hand do you squeeze when you are scared? Are you ever even allowed to be scared? Those questions are ones I have battled with over the last few years. They are the questions that humbled my heroic ego and slowly, cry after cry, cracked open my heart. And what the answers taught me is that we must learn to treat ourselves in such a way that we can trust ourselves. Read that carefully. I didn’t say we need to learn to trust ourselves. I said we must learn to treat ourselves with love and tender care so that we can trust ourselves. The learning is about self-love. Let’s take a few more breaths now. Let that sink in. Picture my little son squeezing the hand of his daddy. Get in touch with that feeling of knowing you are safe because someone you love is there for you. Take another breath. Now imagine that the person who gives you safety is yourself. And that the safety comes from daily acts of self-love — a tender thought, a green juice, a deep breath, a moment of quiet meditation, morning yoga, sleeping an extra few minutes when you’re tired — you caring for you. How does that feel? In the end we create the drama because it’s familiar. We grew up in a scary world and so we find that fear and excitement in our now adult world. And the only remedy I have found is to replace the drama with love … the love of you. I invite u to join me in the practice of #selflove. Love yourself. Take time to #breathe. Enjoy the beauty that is u.
I invite you this week to join me in the practice of self-love. To create a daily practice that creates a you that the child in you can trust. Love yourself. Take time to breathe. Forget the sharks and enjoy the beauty of your life … the beauty that is you. this was another wonderful and thought-provoking article….and I thank you for this!! personally, I am blessed, in that I always feel loved and safe with ian—-what I am working on is the aspect of feeling self-love and comfort with myself. that is a huge part of my journey these days…….and I appreciate your articles, as they help tremendously in the process…..
Big hugs Wendy — thank you for sharing. I love you, Jason! You always say the things I need to hear! Wonderful memory for you to share, and a great illustration of how to nurture our inner child. You are right on, as usual. You are so perceptive, & have such a way with words! I’m so thankful to Twitter for being tue avenue which led me to finding you! Keeping beinc the awesome you that you,are!!! By the way, as an injured swimmer, I simply LOVE the title of this piece! Anything related to swimming at this point gives me a boost…like getting the smell of chlorine on me!